These great people have deployed to Moore, Oklahoma. Follow their updates on Facebook here. 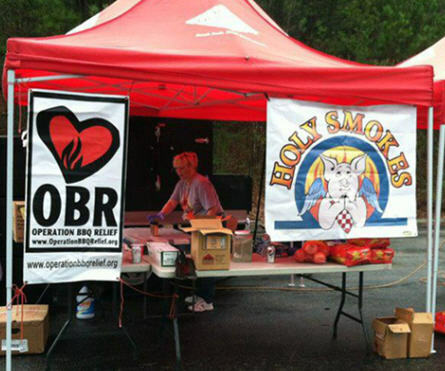 Operation BBQ Relief is a 501(c)3 not-for-profit corporation founded in May, 2011 in response to a need for relief efforts in tornado-stricken Joplin, Missouri. In the wake of this nearly unprecedented destruction, competition barbecue teams from eight states answered the call to help feed displaced families and police, fire, National Guard and emergency personnel. The group was able to serve over 120,000 barbecue meals in less than two weeks during the operation in Joplin. As a result of efforts in Joplin, Operation BBQ Relief was born. The Joplin operation will be used as a model for future disasters such as hurricanes, wildfires, earthquakes, floods and other tornadoes. They are a not-for-profit corporation registered in all fifty states and ready to respond to natural disaster emergencies across the USA. It is a unique group Denise. Love the way that tyhey are using their passion to help others.